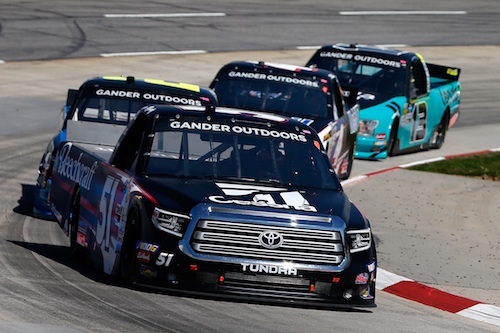 during the NASCAR Gander Outdoors Truck Series TruNorth Global 250 at Martinsville Speedway on March 23, 2019 in Martinsville, Virginia. 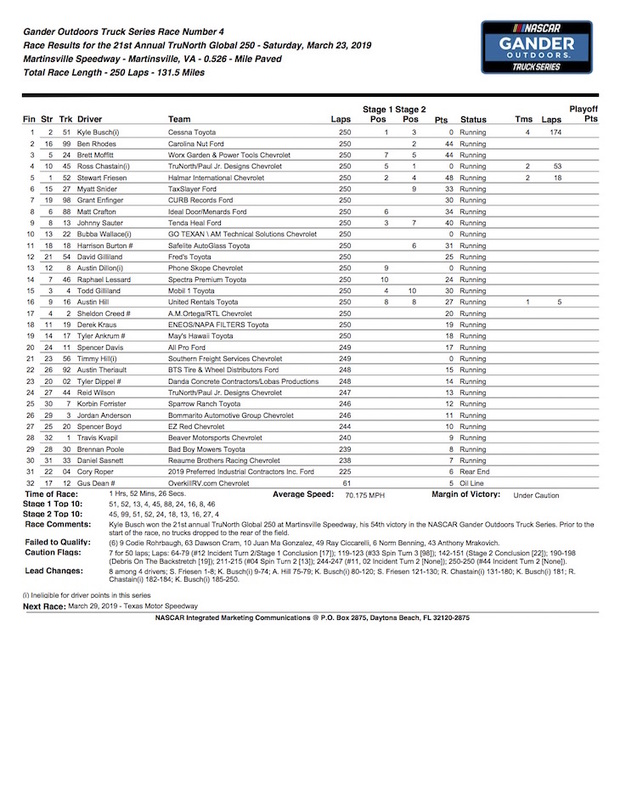 Kyle Busch’s third NASCAR Gander Outdoors Truck Series start of the 2019 season resulted in his third series win of the year Saturday in the TruNorth Global 250 at Martinsville (Va.) Speedway. The win was Busch’s 54th-career Truck Series win, his second at Martinsville, but the first for crew chief Rudy Fugle. The race ended under caution as a result of a spinning, then stalled, truck on the final lap. Ben Rhodes finished second, reigning series champion Brett Moffitt was third, and Ross Chastain and pole sitter Stewart Friesen rounded out the top-five. Busch dominated the race, winning the first 70-lap stage and leading 107 laps by the time the second stage ended on lap 140. He got back to the front on a restart that followed a caution with 62 laps remaining after restarting second to Chastain. Chastain was the winner of the second stage. In all, Busch led 174 laps and Chastain led 53 of the 250 laps that made up the race. After Friesen led the first eight laps of the race, Busch took his first lead on lap nine after racing Friesen side-by-side for the position for several laps. Johnny Sauter got by Friesen for second on lap 30 but struggled with several issues throughout the remainder of the race, including spark plug wire and brake issues and a flat left-rear tire that led to an unscheduled pit stop and a commitment-line violation. He still managed a top-10 finish, finishing ninth. The opening stage ended under caution as a result of a Gus Dean blown engine on lap 63. Austin Hill stayed out to restart up front for the second stage, but as soon as the race returned to green, Busch retook the lead. Chastain, then, moved to second, and Hill eventually dropped to fourth. Busch and Chastain gave up the top-two positions to pit during a caution for a Daniel Sasnett spin on lap 118. It was the first of two cautions coming as a result of a Sasnett spin, the other with 62 laps remaining. Friesen and Moffitt, meanwhile, stayed out for track position, but on lap 131, Chastain took the lead. The aforementioned stops for Busch, Chastain and others were their last pit stops of the race. Friesen and Moffitt, tough, had to pit between the second and third stages after previously staying out. Including the two cautions that separated the race into its three stages, the yellow flag waved seven times. Other top-10 finishers included Myatt Snider in sixth, Grant Enfinger in seventh, Matt Crafton in eighth and Darrell Wallace Jr. in 10th.